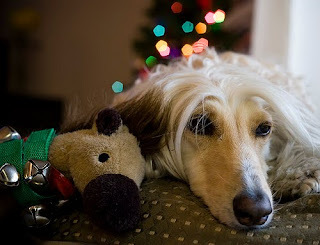 The Whiskey Mattimoe Mysteries: What Would Whiskey Want for Christmas? Whiskey Mattimoe is a Michigan real estate broker who runs her own agency and runs after her errant Afghan hound. In terms of her business, we can guess what she wants for Christmas. It’s what we all want: a solid economic recovery. What Whiskey wants for Christmas on a personal level is a little more complicated. No matter which book in the five-book series we drop in on, Whiskey needs someone to babysit her felonious Afghan hound, Abra. Whiskey has relied on her young neighbor Chester, her stepdaughter’s nanny (and Coast Guard Damage Control Specialist) Deely Smarr, and anyone else foolish enough to volunteer—once. So that item is always on Whiskey’s wish list. 5) A new hairstylist. If I can learn to manage unruly curls with the right cut, so can Whiskey. 4) A wardrobe with less beige and more bling. 3) An ample stock of Pinot Noir so that she won’t end up drinking scotch, which always gets her in trouble. 2) A way to lure Deely Smarr into working for her again. Whiskey’s going to need a nanny, and not just for Abra. And the Number One gift I would wish for Whiskey is . . .
1) One more phone call to Jeb. Read Whiskey with a Twist all the way to the end, and you'll know what I mean. Wait! Sorry. I have another gift to add to her list. I wish Whiskey Mattimoe many more adventures and much more laughter. Exactly what I wish my readers. As for what Abra wants for Christmas . . . that's another story entirely. P.S. The first two Whiskey Mattimoe mysteries (and their cool new covers) are now available on Kindle and Nook. Whiskey Straight Up is a wicked wintry romp, complete with blizzards and deadly plunges through the ice. A perfect fireside read. What Booklist Says About "Whiskey with a Twist"
Whiskey with a Twist: First Review!